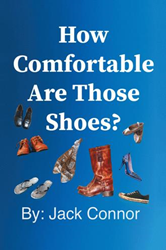 In Jack Connor’s personal narrative and philosophical exploration, “How Comfortable Are Those Shoes?” (published by Balboa Press), Connor shares his outlook on life, drawing on what he has learned through life experiences. The book covers alcoholism, addiction, religious beliefs, second chances, forgiveness, hope, strength, faith and questions that come from it. Connor reflects on personal change, both the possible and unavoidable, and discusses the importance of being your authentic self and being comfortable with it. The book is available for purchase at: https://www.amazon.com/How-Comfortable-Are-Those-Shoes/dp/1982218266. Jack Connor today continues to use his past experiences and the skills gained from each. He has owned his own business for six years. He has been president of a non-profit organization for a drug and alcohol rehabilitation facility. He has been invited to return to speak in the court system he had completed for eight years after. He has also learned from his spiritual experiences that life can take anyone to high and lows at any particular moment.